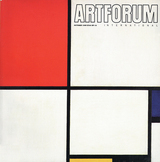 CIRCA 1946: As an arty Manhattan teenager, I thumbtacked onto my bedroom walls a row of color reproductions from the Museum of Modern Art, a precocious declaration of Modernity. I placed Piet Mondrian’s Composition in White, Black, and Red (1936) next to Jean Arp’s wriggly but equally distilled Mountain, Table, Anchors, Navel (1924), in what turned out to be a preview of many slide comparisons in my future (geometric versus biomorphic, etc.). The perpendicular clarity and antiseptic surfaces of the Mondrian clicked partly into place with my Machine Age dreams of a utopian future, but its austerity also made it look more religious than worldly, a Holy Grail floating far above the pleasures of Picasso, Matisse, and Miró.